The cricket day, which is in its sixth year, is a major fundraising initiative for the region and is expected to raise more than $15,000 for EVAWQ, which is the peak body in Queensland for sexual violence, women’s health and domestic and family violence. Douglas Shire Mayor, Mayor Julia Leu, will officially open the day at 11am with a group photograph alongside all the cricketers. Mantra Group’s Area Manager for Port Douglas, Chris Northam, said the day is a great community event and encourages locals, key suppliers, team members and families in the area to come along and enjoy a day of entertainment. “More than 350 people turned up to our cricket day fundraiser last year so we are hoping more people come down to support again this year,” Northam said. “We have countless prizes up for grabs on the day, including an air conditioning unit, a BBQ as well as our major prize of return flights to the Gold Coast courtesy of Jetstar and a family pass to all the theme parks which includes accommodation at a Mantra Group property,” he said. 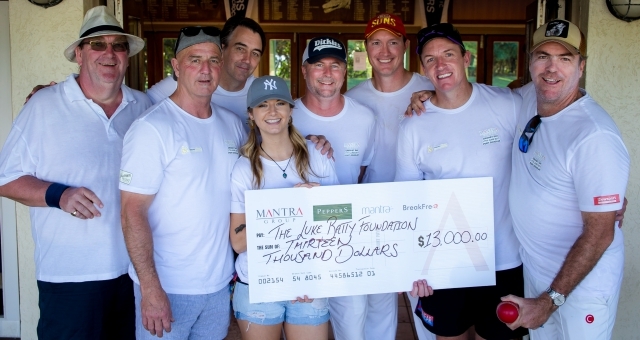 Port Douglas Crocs AFL President, Chris Bradsworth, and Local Cricket Club President, Ben Vikionkorpi, are key supporters in the event, with the two sports codes coming together to assist Mantra Group in their fundraising efforts. “Ending violence in the community is an important foundation for us to support in our community, and it was only fitting that we allowed Mantra Group the use of the sports complex and catering facilities on the day,” Bradsworth said. For more information on corporate sponsorship packages or if you would like to donate to this worthy cause, please contact Chris Northam on chris.northam@mantragrouphotels.com or 0448 195 980.